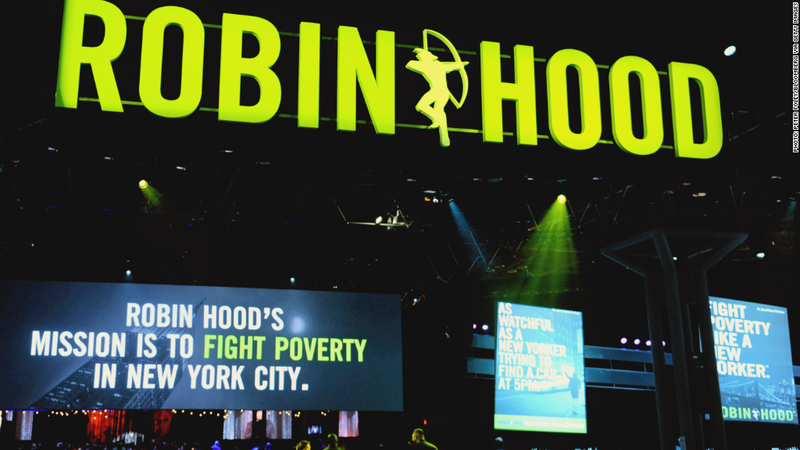 The Robin Hood Foundation raised $80 million at its annual gala Monday night. Big money on Wall Street translates into big donations for the Robin Hood Foundation, a poverty-fighting non-profit organization advised by some of Wall Street's top hedge fund managers. The Foundation raised $80.7 million at its annual gala Monday night, including $25 million from two anonymous donors. The total haul was up 33% from the $59 million generated last year, and is a staggering increase of 72% from 2011, when the gala raised $47 million. Fundraising at this gala is often considered a bellwether for what the top titans of Wall Street expect to earn. As its Robin Hood name implies, many of the top donors to the foundation are some of the wealthiest hedge fund managers and bankers on Wall Street. Money raised from its year-round fundraising efforts and its annual gala is used to further the foundation's mission of fighting poverty among children in New York. As worries surface about a potential bubble brewing in both the stock and bond markets, charitable donations are perhaps one positive aspect of any other Wall Street excesses. The star-studded gala was held at the Javits Center in New York, and featured performances by Elton John, Mary J. Blige, Jimmy Fallon and comedian Louis C.K. The Robin Hood Foundation was founded in 1988 by hedge fund manager Paul Tudor Jones, and hedge fund managers David Einhorn and Steven A. Cohen both serve on the board. Board members cover the organization's cost of doing business, so that all the funds it raises go directly to helping children in New York. Robin Hood is considered to be a model for innovation in non-profit financing. The foundation's recipients include New York City public, private and parochial schools. Roughly 250 graduating seniors who attended these schools were at Monday night's gala. While Elton John and Bono captivated the audience, the Foundation's executive director David Saltzman said that Ashley Ceron, a graduating senior from a Robin Hood-financed high school "moved the crowd in a way no one else did." She will be attending Franklin & Marshall college in the fall on a full scholarship. An earlier version of this story incorrectly stated that the Robin Hood Foundation gala was held at the Waldorf Astoria Hotel. It was held at the Javits Center.